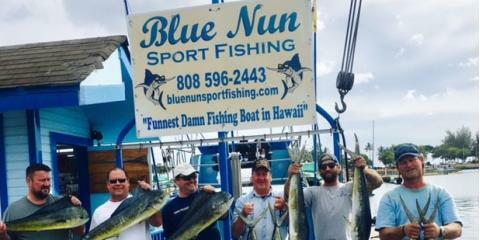 If you’re looking for a good time in Hawaii, search no further than Blue Nun Sport Fishing in Honolulu. Residents and visitors alike know that this local charter boat fishing company is “the funnest damn fishing boat in Hawaii.” For more than 30 years, their staff has been dedicated to creating wonderful experiences for fishing enthusiasts of all levels. Head to Blue Nun Sport Fishing for thrilling big game sport fishing tours out on the open waters. Tours are led by Captain Bob McCowan, an experienced fisherman who’s been fishing in Hawaii for almost 40 years. Take advantage of his knowledge and test your skill at hooking giant pacific blue marlins, striped marlins, and yellow fin tuna. Captain Bob is happy to help you try your hand at reeling in whatever big game you’d like. There’s no need for you to worry about packing up a trunk load of gear. The fishing tour service comes with all the gear and equipment you’ll need. Feel free to pack your own treats and drinks to eat while fishing including alcoholic beverages. From solo trips to small groups, you can take up to six people on each charter tour. For added flexibility, clients can select from a wide range of times to schedule their reservations. 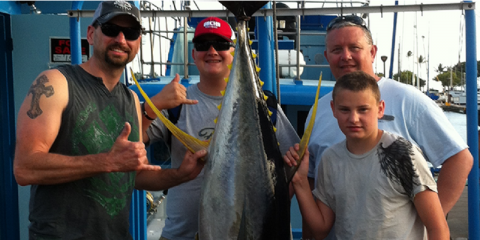 When planning your next Hawaiian adventure, explore the one-of-a-kind sport fishing tours at Blue Nun Sport Fishing. Take time to speak with their friendly staff regarding any questions on licensing and equipment. Call them today at (808) 596-2443 to request a reservation or visit them online for more information.